It’s December 25th, and as Manila sleeps, I sleepily slog through the last three hour stretch before my shift ends. But I can’t sleep without announcing the winners of my Best Travel Photo contest first! 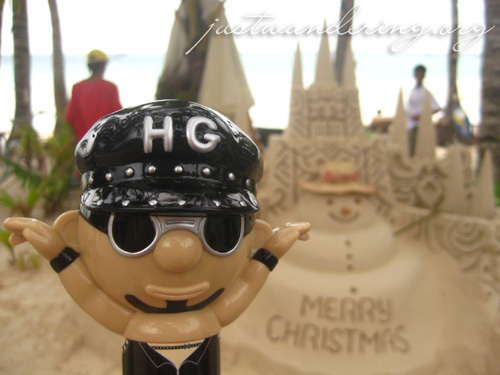 HG and Mr. Snowman-made-of-sand wishes you a Merry Christmas! 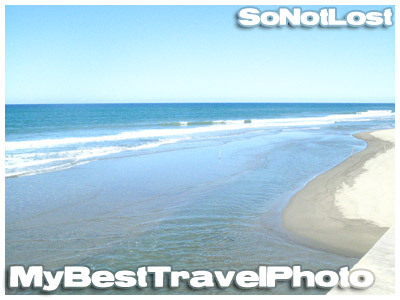 Ren, who is So Not Lost was the first to submit his entry with this photo taken in Vigan, Ilocos Sur. The resort was practically deserted, and when we hit the beach, we were just awed and amazed by our surroundings. It was gorgeous. This picture captures everything I loved about that moment. We were surrounded not by the usual crush of people that you find on other, more popular beaches. All we had was the sky, the sea, and the sand. Everything was simply blue and tranquil, and there weren’t even any clouds to ruin our day. This photo is entitled Muni-muni. 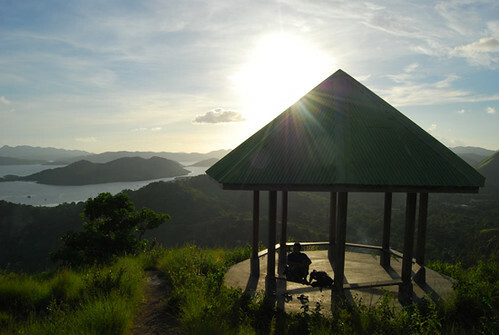 This was taken at the top of Mount Tapiyas in Coron, Palawan. Tapiyas is actually a hill with some sort of monument of a crucifix made of steel. Tourists go there to get a scenic view of Coron. It was a long and tough 20-minute climb to the top. But once you’re there, the view was breathtaking. Very picturesque. Very breezy too. And that’s why this photo was so memorable. Of course, other members of travel group also joined. Gail submitted a photo she took during another trip that we took together. 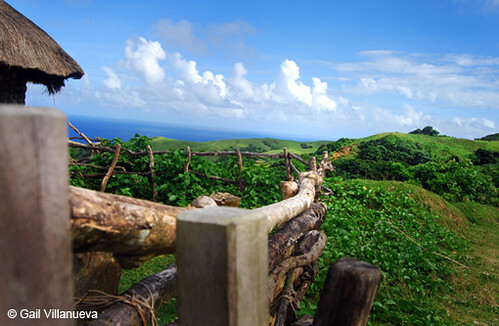 This is a photo of the wooden fence you will see upon entering Racuh A Payaman in Batan Island, Batanes—our very own Marlboro Hills. I took it in a rush, as my husband had already started nagging me to get on the multicab, threatening me that if I ever got left behind, I would never see my Shih Tzu ever again and all I would be stuck with were cows pooping just about everywhere. But I couldn’t help it—I had to take as much photos as I could, just so I’d have something to look back to when I got back to Manila. Not all of them had their photo taken during our trips. 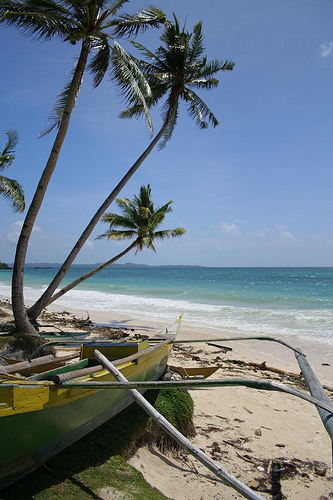 Karla, the second to submit, said that her best and favorite photo was of this idyllic scene at Carabao Island, Romblon. The photo was taken at Carabao Island, Romblon (summer of 2007). I just love how the trees lined up that way just like the way we line up for the assembly when we’re still in either grade school or high school. The beauty of the place has been captured showing its white sand, pristine waters and the magnificent blue sky. 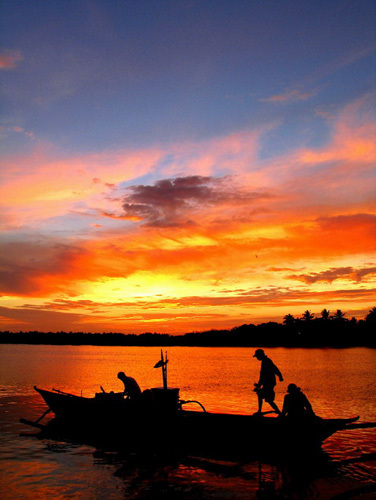 The boat on the photo has added more drama to the photo since it’s facing towards the sea. 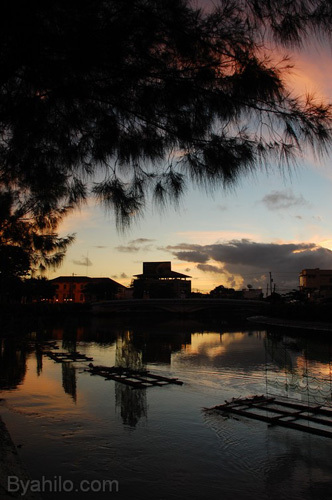 The photo below features sunset at the calm Panay River in Roxas City. I took the photo last November 29, 2008. My trip to Roxas City is memorable to me since this is I guess the only solo trip I had for this year. Travelling alone is very exciting. It gives me the flexibility to explore a certain place at my own pace, without having to think of other people. I don’t have to worry if my companions are allergic to shrimp or garlic. I don’t have to think if my friends who’ll be travelling with me loves to explore old churches or just hang out in the beach. It seems it was mostly my friends who joined my contest. It’s either I’m terribly unpopular or my contests are just too hard. 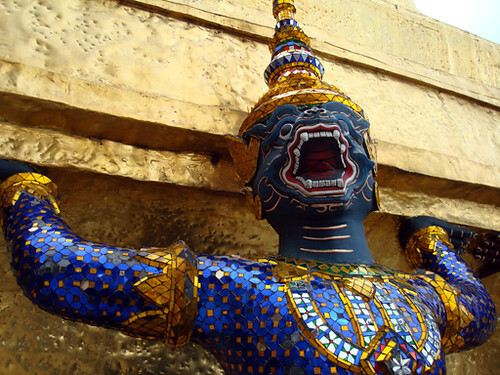 But I’m still glad Rotch took time from her hellish workload to share this photo she took in Bangkok. what i love about this photo is that the subject is so beautiful, it makes it look like: 1) i don’t have a crap camera (which i do); and 2) i am not a crap photographer (which i am). i also loved how effortless it was to take it — there wasn’t a lot of messing around with timing and settings; he was just standing there, waiting patiently, heaving the weight of the domed temple roof on his glinting shoulders. I elected to quickly delete a number of lame pictures of old buildings, set the camera to 640X480, and snap as many photos as I could during the aftermath and clean-up, as 40,000 weary revelers recovered from the carnage and made their way up the meandering streets to the showers and the train station. Along the way I captured this moment, which well represents the sensations of exhaustion and catharsis which follow the intense hour of tomato madness. From the tomato festival in Spain, we are transported back to the Philippines with a photo Melo took during the Butanding Festival in Donsol. I have been to Donsol before and to Sorgogon for countless of times, but I have never seen a sunset as beautiful as the one he captured on camera. After a sunny day, I found myself in a hammock waiting for the sunset in the resorts beach front. That was an amazing day, I got the chance to have a close interaction with a huge whale shark and the best part is…. I don’t know how to swim but thanks to our guide since he practically guided me all the way LOL. However, out of all the gorgeous photographs, one stood out and got the attention of the judges. 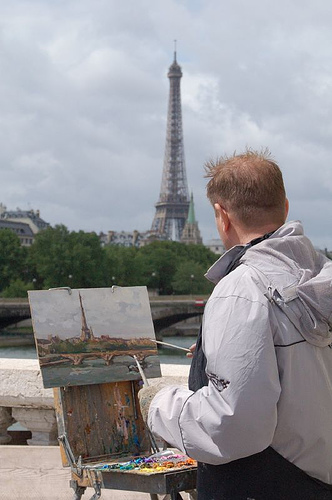 Cathy’s photo of a painter in Paris has a certain charm that simply draws your eye to it. And that’s why Cathy won Justwandering.org’s Best Travel Photo Contest! The picture above was captured during my trip to Paris in 2007. My husband and I were walking from the Eiffel tower and blindly trying to find our way towards the Louvre without a decent map. We did make it to the Pont Alexandre III, a magnificent and highly ornamented bridge overlooking the Seine River on a curve. As we walked through the bridge, I noticed a single artist painting a picture of the famous tower, but I think he was doing it out of sheer joy, not profit. Not a single “for sale” sign around him or loads of similar paintings, so I believe he was painting it as a hobby. He didn’t notice me taking his picture behind him, but I’m happy it turned out well. I wonder if he would have charged me for his photo? Congratulations Cathy! You won a signed copy of Robert Alejandro’s Sketching Backpacker: Backpack Southeast Asia and some parts of China, Jetro Rafael’s Backpack Photos postcard book, and a year’s subscription of flickr Pro! Yippee! It’s the BESTEST Christmas present ever! Thanks Nina, Ferdz, and Estan! Wonderful pictures! But I like more the stories behind the shots, making them so vivid and touching. Congrats to the winner! Merry Christmas!!!!!! I wanted to join your contest but I am not too good in my photo skills yet. You know, I pretty much prefer friends or readers to join my contest. It’s a way to show appreciation. Anyway, next time I will join. Hope you had a wonderful Christmas! congratulations to the winner!!! and also thanks to the judges. i hope that ill be able to participate soon. that’s when i get a DSLR.